>> Hole in Your Trampoline? How to Fix it? Trampolines are sources of fun, and they are used for regular exercises for a few people. As these come costly, it is hard to imagine them getting damaged due to one reason or the other. Even a tiny hole that develops in a trampoline can be dangerous for the ones who are using it. You should check your trampoline regularly for holes and take timely action to prevent fatal injuries. When your trampoline is in good shape, your family members can enjoy thoroughly and stay safe jumping. When a trampoline is purchased, hardly anyone thinks of the tears and the holes that can develop on the mat of the trampoline. However, if the trampolines are used on a daily basis, even the costliest of the models can develop tears. The areas that normally tear are the mats and the nets. You should not spend a huge amount of money on repairing the parts that have been damaged. You can carry out tiny repairs on your own. Also, you do not need to be a do-it-yourself expert for fixing your trampoline. Only a little knowledge and the proper pieces of equipment are what you need. Before fixing your mat, you should know that a few tears cannot be fixed at home with ease. If your hole is bigger than two inches, it can be extremely dangerous to keep using this mat even after it has been repaired. In this case, you should purchase a new mat. You should not allow these tears to develop at all. You should ensure that you keep checking the trampoline mats at regular intervals so that you can spot the small holes before they develop into larger ones. Small holes can be fixed without any struggle in your home. If any damage comes to your sight, fix it before you allow others to get back on the apparatus. Firstly, you have to remove the mat of the trampoline from the frame. You will get a repair kit when you purchase a trampoline. Find the patches of the replacement materials there. The instructions will clearly state the type of stitch that you have to use for repairing your trampoline. If you do not have a replacement kit, you can buy it from any online retailers. You have to use a sewing machine for sewing the edge of the patches. You should do this two or three times to make it completely secure. After this, you can trim the extra material that is hanging. Now, you can enjoy jumping on the trampoline without any fear of injuries or bigger holes. If you lack a sewing machine in your possession, or you do not know how to stitch properly, you can purchase the repair glue for your trampoline. Repair glues are easily available from the online suppliers. In this case, you will repeat the same method, the only difference is you do not have to stitch, you have to glue the mat. However, you should allow it to dry for an entire day before you can use the trampoline again. If you want the mat to look perfect, the best option is to sew it instead of gluing it down. 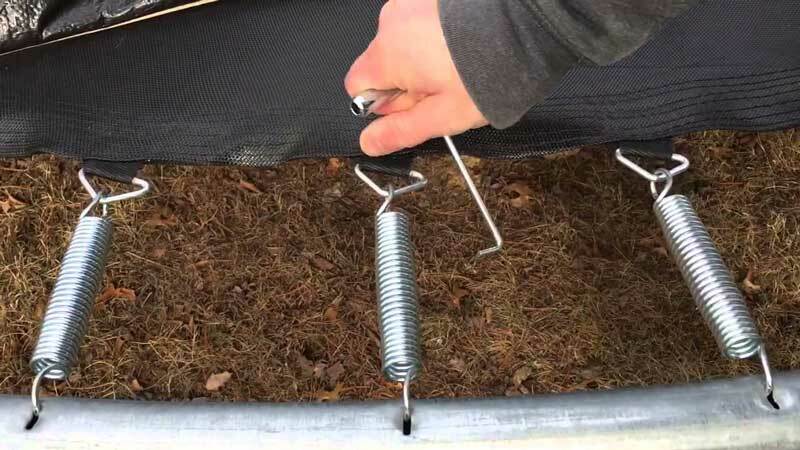 You can use two methods for repairing the safety enclosure of a trampoline. These methods depend on the budget that you have, the finish that you want, and the efforts that you are ready to put. These two methods include the patch repair and repairing using duct tape. If you opt for patch repair, it is obvious that the finish will be better. However, you will need repairing patches, fishing yarns, and sewing machines. If you go for the duct tape repair, you will be able to do it quickly and easily. Remember that you can repair the net only if the hole is small. If it is big, repairing it won't help. It can be unsafe as well. In this case, it is better if you purchase a new one. For duct tape repairing, you have to apply the tape on the front and the backside of the hole. You have to apply pressure on it to ensure that it has adhered properly. Several layers of tape will be required to secure the hole. Try not to compromise with your repairing strategies as you are doing this for the safety of your family members and yourself. In the end, if you feel that it is impossible to repair the damage on your own, you can call for experts or replace the mat or the net completely. Remember, safety comes before enjoyment and you should do everything you can to remain safe.